Members of the Cook Wellness team accepting the American Heart Association Fit-Friendly award. Bloomington, Ind. 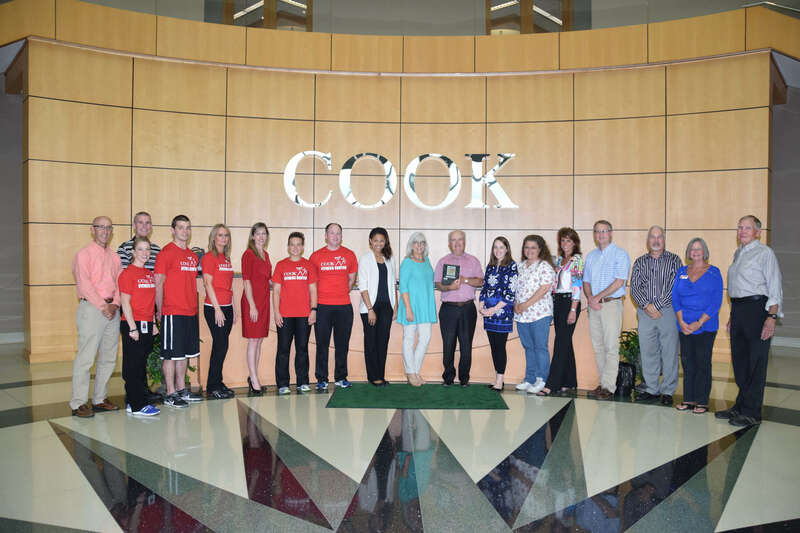 – Cook Medical has been recognized as a Gold-Level Fit-Friendly Worksite by the American Heart Association for helping employees eat better and move more. Gold level recognition is awarded to worksites that fulfill criteria such as offering employees physical activity support, increasing healthy eating options at work and promoting a wellness culture. Requirements for Gold level achievement are a minimum of 25 employees at the worksite, as well as implementing at least six of the physical activity criteria, two of the nutrition criteria and one of the culture criteria listed in the application form. For more information about the Fit-Friendly Worksites program and how it’s helping to improve the health of Americans by focusing on the workplace, call Carmen Parker at 317.732.4761 or visit heart.org/worksitewellness.